If you don't know what PBCH(Physical BroadCasting Channel) is, refer to Physical Layer Channel : Downlink : PBCH (Physical Broadcasting Channel) page first. % First you have to define properites of a eNodeB. % Now you have to generate MIB bits. 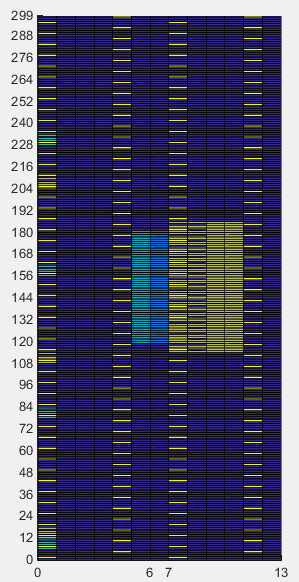 This is basically the bit string that you can see from ASN Decoder. 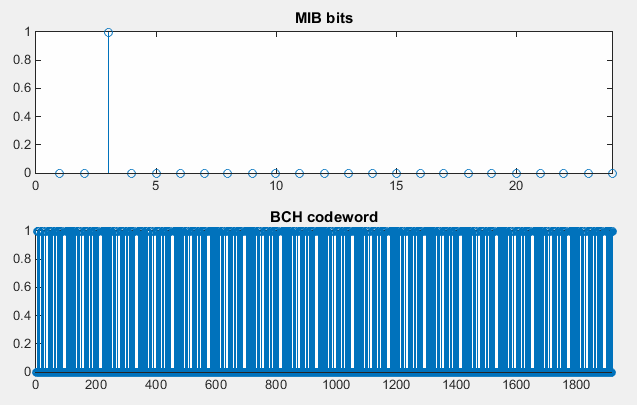 % Next step is to apply the channel coding process to the MIB bits (a kind of user data). 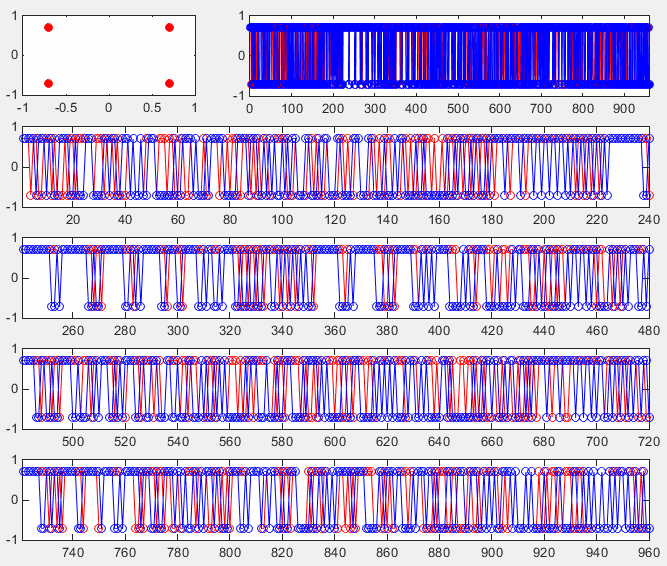 % Now I want to show you the two sets of data generated above into a plot. % but it would be easiler to see overall meaning rather than looking at all the ones and zeros. % this is the plot to show the MIB message itself. It is just layer 3 bits. 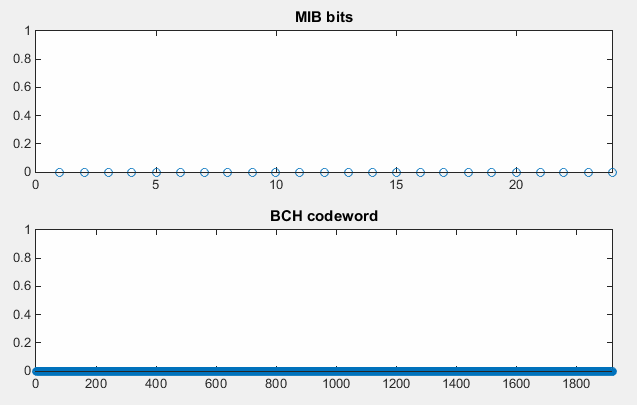 % this is the plot to show the result of channel coding (the result of lteBCH()). The first example show the case of MIB message with System BW = 1.4 Mhz and Frame Number = 0. As you see, all zeros in layer 0 message and all 0 even after the channel coding. One possible motivation from this example would be just to have 'question' (no need to have answer yet) how the small number of bits can get converted into such a long/huge number of bits (over 1800 bits). This example is almost same as previous example. the only difference is the channel bandwidth. I used 3.0 Mhz Bandwidth and it sets only one bit to be '1'. As you see in the second graph (the output of channel coding), you would see much more complicated patterns of ones and zeros. Why ? Just have a question is enough. Following is for the case which is same as the first example except NFrame (SFN). I guess you would see the difference. If you have LteToolbox, Try enb.NFrame = 1,2,3 and see what you get ? Are they all the same ? or different ? If they are all same, would you be able to explain why ? 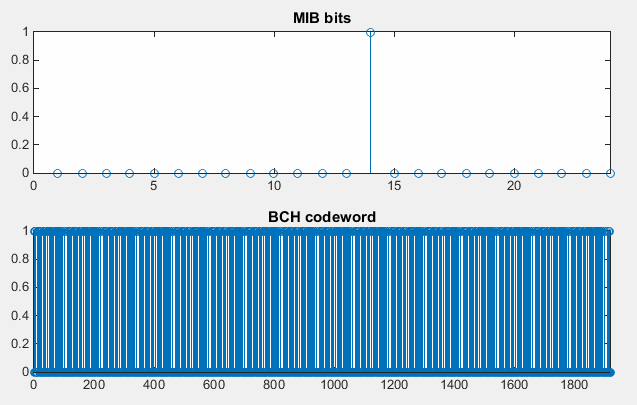 In this section, we will convert the encoded BCH data into physical layer symbols and plot them into constellation and sequence plot. % Now I will create a bunch of graphs showing different aspects of the PBCH symbols. % constellation of the whole PBCH symbols generated above. % onto separate graph. Why did I split into 4 clusters ? What would be the meaning of the each cluster ? 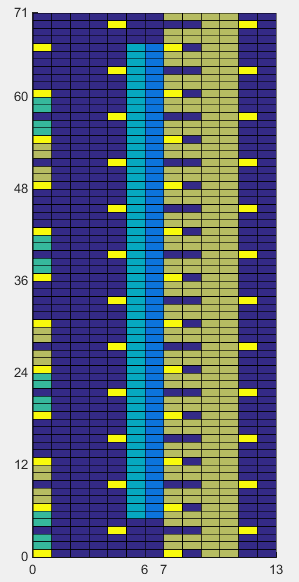 % see SIB Scheduling page. In this step, I will show the Resource Elements that will carry the PBCH symbols generated at previous step. % following is PHICH parameters that will be used ltePHICH() function in later step. % Following is to create an empty resource grid for one subframe. % with real symbol number, I just filled it with a constant that I arbitrarily set. This is just for visualization..
% transmission (not for visualization), fill the resourceGrid with real symbol value you generated above. The first set of examples shows the location of PBCH Resource Elements in 1.4 Mhz BW. The light green REs in the symbol 7~10 represents PBCH. Can you count how many Resource Elements are for PBCH ? Maybe a little confusing to count, but it should be 240 REs, meaning it should carry 240 symbols. The first set of examples shows the location of PBCH Resource Elements in 5 Mhz BW. The light green REs in the symbol 7~10 represents PBCH. Can you count how many Resource Elements are for PBCH ? Maybe a little confusing to count, but it should be 240 REs, meaning it should carry 240 symbols. 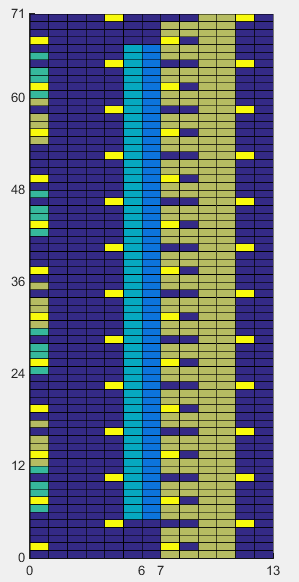 Number of REs stay same regardless of system bandwidth.